Anybody who enjoys dogs and wants to find out more should visit Dog Star Daily. I believe the term “Retreat ’n Treat” was first coined by Suzanne Clothier. I initially called the technique “Retreat With Honor” after getting into a dodgy situation with an Akita. Basically, we were much too close and the situation was beginning to escalate — the Akita growled and I reprimanded. Both of us desperately wanted to normalize the interaction without losing face. The Akita had bitten four men, each with hard Level II bites (considerable bruising but no skin puncture), so I had instructed the owners to muzzle him before I arrived. As I introduced myself in the usual fashion, “Hi Mr. Akita, I’m your trainer and here’s some food treats,” he stoically lifted one front leg and flipped off his muzzle. I quickly tossed some kibble over his head and delicately back-pedaled, dropping several pieces of freeze-dried liver as I retreated. The Akita turned to truffle up the kibble…and then turned again…and approached…agonizingly slowly…eating each piece of liver as he came closer. I was trapped at the end of the hallway, so I threw some more kibble over his head and then some more liver behind him as he retreated. This time his approach was a little quicker and a little less stiff, and so I repeated the procedure. After cautiously sniffing each piece of liver, he would look up at me — the anthropomorphic among us might say, suspiciously — before eating the treat. But after half a dozen or so repetitions, his approach became much more relaxed, and so I offered him three pieces of liver from my hand. His body language seemed to say that every thing was cool and so I retreated and lured him to come and sit and lie down. We repeated this over and over and then embarked upon some routine handling exercises. The entire session took about one hour, in which time the Akita learned that there was at least one male human that he could begin to trust. 3. Always wear protective clothing and Kevlar gloves when working with hard biting dogs. Much more important though, I learned, that even when interactions are headed in the wrong direction, just a few liver treats can quickly turn them back to gold. At that time, the dog training climate was a little different from today. The standard approach for biting, and even growly, dogs was, “Show them who’s boss!” Even back then, this approach didn’t make much sense (and it makes even less sense to me now). Presumably dogs have darn good reasons for growling and biting, and to respond physically would only give them yet another reason to growl and bite. However, when I lectured about my techniques the usual response was, “You gave a treat to a biting dog!? !” It’s indeed refreshing to think that nowadays — a little over twenty years on, Classical Conditioning and Lure/Reward Training are techniques of choice for dealing with fearful/biting dogs. In a nutshell, Retreat ‘n Treat comprises lure/reward training a fearful dog to retreat for kibble but super-luring and ultra-mega-rewarding him for approaching with liver. Once the dog approaches quickly and loosely and takes a food treat (both of which are extremely powerful and revealing temperament tests), you have him. As a trainer, you now own his brain, his feelings, and his actions. It’s now easy to establish control and teach the dog to sit and down stay. And whether he wants to or not, the dog will begin to like you. When working with fearful dogs (and most biting dogs are fearful), a common pitfall is to work too fast and too close, thus making the dog more fearful. The dog will approach only so close and will always remain within his safety zone (flight distance) — a highly specific distance for each individual dog. If you approach, or reach forward, you will stress the dog, who will likely retreat. A common mistake is to reach forward with a food treat to try to lure the dog to approach. The dog may tolerate your hand penetrating his flight-distance and take the food treat but then he’ll quickly retreat, or snap and lunge (to prompt you to retreat). There is a big difference between a hand with food treats penetrating the flight distance and an empty hand that is already too close. Always remember to have a bunch of treats in your hand, so that as the dog eats one treat, you can immediately show him that you have more. Retreat ‘n Treat is yet another example of Murphys’s Law in Dog Training — whatever you really want a dog to do, ask him (or lure him) to do the opposite. In this case, if you would like the dog to come closer, try to teach him to go away. In terms of animal behavior (and underlying emotions), proximity pretty much reveals everything, and the manner of approach or retreat tells the rest of the story. In our research of social hierarchies at UC Berkeley, we found that “doggy buddies spend time with each other” and that dogs approach friends very differently than dogs they don’t know. These are hardly world-shattering findings for anyone who lives with a dog, but the raw data on proximity and approach were blindingly striking. With fearful dogs then, a major goal is to build their confidence so that they approach quickly and loosely and then stick around (sit and down stay). This of course raises the popular psychology question: Do animals become more confident when taught to model confident behavior? Mostly likely, yes. Teaching the dog to come and sit and lie down on cue encourages and reinforces prosocial behavior. Also it teaches the dog, how to act. Not knowing how to act when stressed can cause an animal to display an entire repertoire of hyperactive tics and sterotypies. Simply teaching a dog to sit stay, decreases activity and induces calmness. In a sense, the sit stay acts as a “behavioral pacifier.” This technique is much the same as teaching scared public speakers to stand with their feet one foot apart and to hold their hands behind their back. Equally important, especially with biting dogs, by teaching the dog to come and sit and lie down the trainer is establishing control and the dog is demonstrating compliance. Certainly the dog responds happily and willingly, but of course in pet dog training, happy and willing compliance is the only way to go. In my brief encounter with the Akita, I was very lucky; the dog loved food treats. Indeed, whether or not a dog takes a food treat can be very revealing. 1. 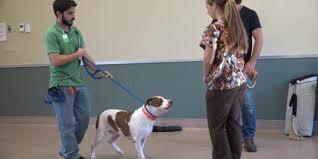 If the dog takes a treat from the trainer, usually the dog’s training will proceed smoothly and quickly. 2. If a dog refuses to take treats from both the trainer and the owner, most likely the dog feels stressed by the situation and so, proceed slowly. 3. If the dog refuses to take treats from the trainer but readily does so from the owner, most likely the dog feels stressed by the trainer (i.e., you!) and so, proceed very slowly. The major prerequisite for classical conditioning and progressive desensitization is that the dog will readily accept a primary reinforcer. The two reinforcers (hugs and praise) that we would most like to use with shy and fearful dogs often make fearful dogs more fearful. That’s why we use food. If the dog accepts treats, you have a great shot at quickly changing his behavior and temperament. However, if a dog refuses treats, both classical and operant conditioning will take a very (VERY) long time. To facilitate success, the most useful advice is to handfeed the dog for at least one week prior to the first training session. Adapted from an article originally published in The Chronicle of the Dog — the Newsletter for the Association of Pet Dog Trainers (www.apdt.com). Trigger stacking: how we set our dogs up to fail. How easy it is to make a mistake without even realizing it, especially with a dog we have just brought into our home. Why would a dog kill its owner? It is regarded as bizarre that man’s best friend for at least the last 12,000 years should turn on its owner and kill that person. Dog is Marking - Ask a Trainer..A dog that was previously house trained, suddenly starts to eliminate in the home - what could the reason be?